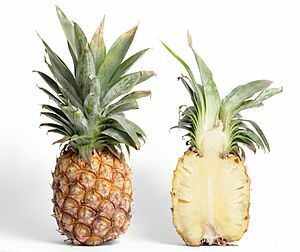 Pineapple is a kind of multiple fruit. 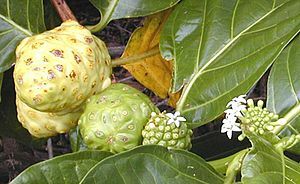 Multiple fruits are fruits that grow from more than one flower (called an inflorescence). Each flower in the inflorescence produces a fruit, and then these join together. There are also many multiple fruits that become dry later. In languages other than English, the meanings of multiple and aggregate fruit are reversed. 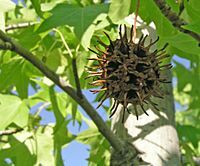 In Liquidambar, the multiple fruit later becomes dry. fig, tiny flowers are inside the fruit. Multiple fruit Facts for Kids. Kiddle Encyclopedia.